“The situation regarding women choosing exact sciences is similar across different countries – although more and more girls are studying these subjects, not all work in this area,” says Gerda Aleksandravičiūtė, Project Manager at Adeo Web. A young specialist, who recently taught in Palestine, said she was surprised that the situation for Lithuanian women regarding this issue is not much better than the Palestinian’s. According to EU data, out of a thousand women with a bachelor’s degree, only 29 are graduates in the information and communication technologies field, and only 4 become employed in this sector. According to the statistics provided by the European Commission, if more women were to be employed in digital technology, total annual European production would increase by 9 billion Euro. G. Aleksandravičiūtė, who studies applied mathematics at Kaunas University of Technology (KTU), claims that she chose exact sciences because of their versatility – knowledge of mathematics provides a solid basis for further studies and career paths, whichever direction you may later choose to follow. This Autumn, the young woman, who has been leading teams of IT professionals for several years now, shared her work experience in Palestine. Training sessions aimed at women were organized by the Lithuanian Ministry of Foreign Affairs and the Palestinian Television ‘’Wattan TV’’ where women with many different experiences and aspirations learned IT skills. 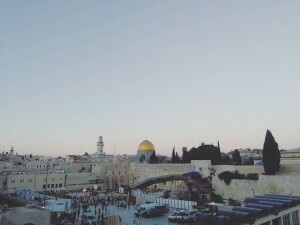 In Palestine, her exceptional experience was not the only thing that left an impression – Europeans accustomed to a visa-free regime were faced with persistent Israeli checkpoints, and scheduled trips to Jerusalem and Bethlehem had to be cancelled due to armed clashes – but also the training itself and its participants. “In Lithuania, young people, students, usually come to the classes. In Palestine, we had a very diverse group – the oldest participant was about 60 “, says G. Aleksandravičiūtė. According to her, the training surprised not only the participants but also the leaders – the Lithuanians assumed that the Palestinian women will have much little skills and experience regarding technology, while the Palestinian’s believed that women in Lithuania were doing much better in the IT field. Although we do not have religious constraints or certain cultural stereotypes in Lithuania that would limit women’s opportunities, Lithuanian women with IT-related careers are also a minority. The objectives of the participants in Palestine were mainly related to the development and promotion of businesses – an owner of a bakery, a wood embroidery entrepreneur, a girl who wanted to become involved in real estate, and so on. “It was very interesting, just imagine, one of the participants in the course embroidered her bed! Another woman told of how life abroad inspired her to build a real estate rental company that would provide high-quality services since in Palestine such services are not yet reliable. But the best thing was the fact that women, who met each other in training, established contacts and could share experiences. For example, one has a bakery, the other – a photo studio, they immediately discussed collaboration, ” said G. Aleksandravičiūtė. G. Aleksandravičiūtė led a teamwork seminar based on ‘’Agile’’ methodology for the Palestinians, which emphasizes that the core of each project is a team and that planning is required for a maximum of two weeks, thus maintaining the flexibility that is crucial in this rapidly changing world. The method was developed for IT business at the beginning of the 20th century, but it is now also applied to other activities. “Using this methodology, we also work on ‘’Adeo Web’’ – I am responsible for assigning and coordinating tasks, and for communicating with the client. Today I have 7 people on the team, this is the optimal number. As the number of people grows, communication is no longer as effective, and then the number of project managers in the team should be increased, “says Aleksandravičiūtė. According to the young woman who studies mathematics and finance, there is no need for a lot of IT knowledge when communicating with programmers. “In this career, it’s important for everyone to speak one language. Programmers are specialists in their field, one works with one technology, one with another. The project manager is the person who must answer all the questions – both the team member’s and the client’s. It is impossible to know everything 100 percent, but I have the basics, and if something is missing, I’ll find out more about it, “says Aleksandravičiūtė. When asked if girls should choose not traditionally “feminine” careers and work environment, G. Aleksandravičiūtė ensures – it is necessary. “The exact sciences are not so-called” rocket science “, I think that they can test themselves, and anyone can even change their career. By the way, more and more girls are choosing these careers – for example, when I joined KTU Applied Mathematics, in our course, for the first time in the history of the faculty, there were more girls than boys “, recalls G. Aleksandravičiūtė. True, today at the ‘’Blaster’’ IT Enterprise cluster, across the 6 established companies with over 200 professionals, female programmers, are a minority. According to G. Aleksandravičiūtė, she does not feel at all discriminated against. “If there is any misunderstanding, it’s not because I’m a female project manager, but because I’m young. But we are all young in the IT field because the area itself has been formed quite recently in Lithuania, “says A. Aleksandravičiūtė, director of e-solutions company ‘’Adeo Web’’.